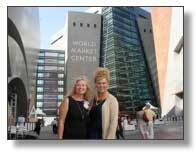 Your Designer Society of America was well represented at World Market in Las Vegas last month, as I spent several days networking with industry professionals, all working together for the greater good. In addition, I attended numerous seminars to see what others across the nation are working on and what priorities are set for the coming year. By my side was Patti Morrow, executive director and lobbyist with Interior Design Protection Council. As always, her in-depth knowledge of lobby issues affecting designers was a shining light and many took notice of the information we shared as well as the challenges we made on important issues during seminar discussions. In fact, Patti was asked during one seminar to stand up and update interior designers on the current legislative progress to protect our rights. This proved to be very exciting with an overwhelming response from interior designers who support the IDPC (Interior Design Protection Council)stance on protecting designers' rights to practice, whether or not they have chosen to take the NCIDQ exam. In the meantime, our 2 for 1 membership special offered in conjunction with IDPC will continue due to its great success for the Interior Design Protection Council's efforts to bring in addition members and spread the word about the serious lobbying efforts the council makes on behalf of all designers. If you haven't joined yet, consider doing so today. This group's number one priority is fighting for your rights to practice and they deserve our support. Also, our new DSA membership cards have arrived! If you have not yet received your card, email us at support@dsasociety.org please remember to send us your full name and address, we will locate your membership number and send you your membership card. Adelene Keeler Smith holds a five year bachelor of science degree in interior design from the Florida International University School of Architecture in Miami, FL. Recipient at graduation of the Award for Distinction, presented by Adolfo Sardino, fashion and millenary designer for former First Lady Jackie Kennedy, Keeler Smith worked in the fashion industry throughout college as a professional model for facial, hand and specialty sizes. An associate member of the American Institute of Architects, Keeler Smith launched her interior design career under the tutelage of several prestigious interior designer and architectural firms. In private practice now for 18, years, Keeler Smith enjoys variety in her work and takes on projects in various states and regions of the U.S. Having lived in Hawaii, Rhode Island and Washington, D.C., her extensive travels give her a keen insight into and appreciation for fine architecture and exquisite design. Throughout her career she has cultivated a life-long passion for well-ordered, edited and beautifully orchestrated interiors. A popular guest lecturer and visiting professor, Keeler Smith's work has been featured in a number of magazines and on television. Magazines include Southern Accents, Interior Design, Professional Builder, Fine Home Builders, Miami Herald, Philadelphia Home and Palm Beach Post. Among her many awards are 12 ASID Awards for Excellence and a second place finalist for green design residential project in Southern Accents' 2008 National Design Awards. Also a pen and ink artist and watercolorist, Keeler Smith produces a monthly column for The Department of the Interior in the State College Magazine. TO THE DESIGN TRADE ONLY is pleased to offer many sources to the design trade only at a very low mark up above our cost. For two and a half centuries, generations of stitchers have created exquisite embroidered heirlooms. Today, European Design brings this old world elegance to the modern market, allowing designers and decorators to add a distinctive touch to a variety of materials. Drawing from years of experience in the delicate craft of hand stitching, our original and coordinating designs offer the customer a personalized work of art. 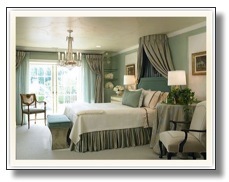 European Designs, Inc. has been attending to details for over 10 years for some of the country's top interior designers. We are a full service, custom design embroidery and monogramming shop, specializing in unique custom embroidery, monogramming and sewing. Fabrication also available. If you want the finest quality embroidery for your interiors, let European Designs add you to their prestigious client list, which includes such renowned designers as Thomas Pheasant, Barry Dixon, Whitney Stewart, Annette Hannon, Gary Inman, Marlies Venute, Susan Wadsworth and David Heachik. For more information, visit them in the vendor's section of the DSA website at www.dsasociety.org. I ask you to consider this question: Where will your business be when the economy takes a turn for the worst? AAPE. Articulate. Align. Plan Execute. The first step is to articulate what your ideal client looks like in order to position your business accordingly. It's like deciding how to dress for the opera. Do you want to be formal, dressy, or casual? How do you want your business to be perceived by the people that matter? Of course, the attire that I am referring to is the collateral marketing material that you choose to represent your services and product. It must be of the quality consistent (or better, preferably) with what your potential client is used to receiving from competitors. The second step is to align your marketing with non-competitive industry colleagues. Why go at this alone? The same ad, direct-mail piece, show house, or sponsorship can be underwritten by someone that you respect who is targeting the same client. For instance, a solid alliance can be made with an architect, interior designer, contractor, landscape architect and others. Depending upon the scope of a project, numerous professional and trades people can be involved. There is no reason that each company has to recreate the wheel. With more money combined, it is possible that more sophisticated marketing can be explored. Naturally, planning is the roadmap to the future. A single ad in a journal is unlikely to provide lasting value to a business and is very "shotgun" in approach. Marketing is a comprehensive system that involves components of 1:1 events, advertising, direct mail, web development and public relations. Alone, any one of the aforementioned items may seem sufficient, but usually do not yield the most effective results. So take the time to develop a strategy and put it in writing. And lastly, execution is paramount to success or failure. Even the best design fails when the implementation is faulty. Chances are you are too busy to create a plan, let alone to implement it. So make sure that you have money to have someone else do this phase of your marketing. At the end of the day, you will make the most money by doing what you do best: design. So, how will you be weather an economic downturn? Hopefully, with response to the marketing campaign that you implement right away. Remember, seeds that you plant today may not come to fruition for six months to a year, so get started! Depending on the wall color in a living room space, the furniture can look either cold and pretentious or intelligent and thoughtful. Wall colors give the loudest first impressions about who you are and how you feel about your home. Often, if we fall in love with a rich, saturated, strong and gorgeous color, we are afraid to use it, afraid of what it will say about us, that it will be too much or take over. Yet you want to use it somewhere because you love it so you decide an accent wall is the answer to using that color safely. But there are risks involved. Do I have a wall that really needs to be shaded, highlighted, or deepened or am I just in love with the color I'm afraid of? What would the rest of the wall colors and ceiling color have to be to make the accent color look balanced and nestled in, without being too tense or heavy? Will adding an accent color add interest to the room or does it make the room sink or float at one end? Devine Bordeaux, a deep wine color may look stunning on every wall instead of just one. If properly sandwiched between deeper, supportive neutrals like Devine Filbert, Mocha, or Pecan instead of lighter shades, Devine Bordeaux can bring focal strength without standing out like a stop sign. Think of your room as a box, with four sides, a bottom and a ceiling lid. All sides of the cube should have beautiful color and be balanced by great color relationships on every side. Sure ways to use accent walls include balancing big furniture, shelves, alcoves, or fireplaces. Think of accent walls as L-shapes and U-shapes, and ceilings not just single rectangles. 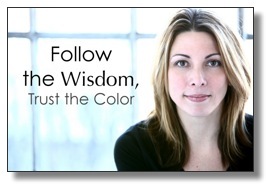 Don't forget - a color within a beautiful color relationship, like a sunset, brings awe to the eyes and joy to the mind. That's the power of color. Embrace that power and make your room say what you want it to say. Don't have it any other way. "Taking action and confidently painting colors that speak about who you are is what makes a room or a home beautiful from the inside out. Devine Color was created to express who you are. Confidence is what makes a woman feel beautiful from the inside out. So they can feel like they wouldn't want it any other way." In recognition of National Kitchen and Bath Month, NKBA is offering an education sale to all DSA members. Register for your first course at National Kitchen & Bath Month rates and receive 15 percent off the cost of your second course. This offer is effective October 1 through October 31, 2009. Call NKBA Customer Service at 800-THE-NKBA (843-6522) to take advantage of discounted rates. Last month we talked about Feng Shui for your living room and the focal point rule. This month we continue with tips for that space. Look to see if there is an established architectural focal point, such as a fireplace, alcove, or bay window that will be the center of your design. If not, create a focal point. It can be a beautiful painting, piano, or entertainment center, depending upon the room's purpose. Once you have determined the focal point, place the largest upholstered piece facing that point. This position will assure you visual access and balance. The exception to this rule is if the focal point is opposite the entrance. In this case, place the sofa perpendicular to the focal point. You do not want to walk onto the largest piece of furniture nor have your back to the entry. This will give the person sitting on the sofa a feeling of unrest, as they would not be in a command position. If the sofa has to be placed in this vulnerable position, be sure to place a console table behind the sofa to create mountain, supportive energy. We all feel more comfortable when we know there is a support system to enrich us. If your quarters are small, a simple throw on the back of the sofa can affect the same results. Be sure the throw lays halfway down the back of the sofa. Next, place an area rug for easy direction and movement. Area rugs hold the grouping of furniture together, anchor the chi flow and can be used as a color palette for the room. It is best to bring a color from the area rug up into the room. 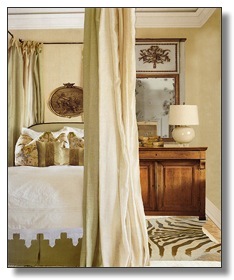 You can do this by adding throw pillows to the sofa or adding a ribbon of color to the leading edge of the draperies. Here at the School of Graceful Lifestyles, we call it "marrying up the room," as it gives off a feeling of wholeness and completeness. 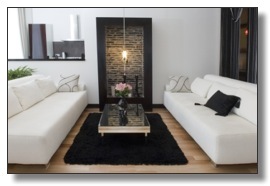 Check back next month as we continue the Feng Shui tips on creating a living room space. The heart of sustainability is a striving to live in harmony with the earth's systems. But sustainable design is loaded with all kinds of technical information as well as prescriptive do's and don'ts. It's easy to lose sight of connecting with the earth. And the design, as in the essence of what we create, can seem to just slip away under the heavy load of the additional guidelines. Contemplating this led me to realize how one sustainable design concept can help support sustainability and enhance our designs: the use of regionally available materials. Regional materials can boost the inherent beauty of each project and at the same time support our connection with the earth. The use of regionally available materials is considered a positive sustainable practice because it reduces the amount of fossil fuel typically used in transportation. It also supports regional economies. But I've been thinking about it in terms of design and all the beauty that is inherent in regionally influenced aesthetics. Regionally authentic aesthetics are about the spirit that is embodied in regional designs; a spirit that is the sense of place embodied in the design and reflected from the design. Regionally authentic designs sing with their unique beauty as well as their sense of place, in part because they are made from regional materials. If materials and forms are of the place, then there is a genuine connection with the land. It is this connection that we have so often lost. But we can begin to reclaim the connection by using regionally available materials. I'm imagining two extreme examples. How differently would we feel if we visited an Inuit village in Alaska with igloos made from snow compared with visiting a log cabin in Montana made from native trees? I would feel totally connected with the people and with the land in each place because each is made from the land and therefore of the place. But each would feel artificial and just plain wrong in the other's location. Historically, interior designers primarily accessed materials within their own region. Everyone's "world" was smaller then. But as world markets opened up and we all became a part of the global economy, knowing about unique resources from around the world and bringing them to our clients became one of our services. Now, with the emerging awareness of the costs of materials that are not "of the place," it's no longer professionally responsible to choose imported materials when we can choose regionally available ones. Sure, it's tempting as designers to use any material we learn about: tile from Italy, bamboo from China, or wood from South America. Not using them does limit us. But it can also expand us by challenging our creativity as we use a more limited palette of sustainably responsible materials. 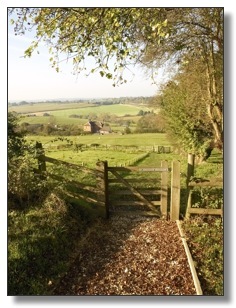 We can create a new twist on regional aesthetics and join in creating a new regional aesthetic heritage. At the same time we'll be helping to regain our connections with place, which is, more simply put, our connection with the earth.